Cian to read Christmas Day news - thanks to Jedward! Cian Burns with Jedward and RTE news anchor, Bryan Dobson. 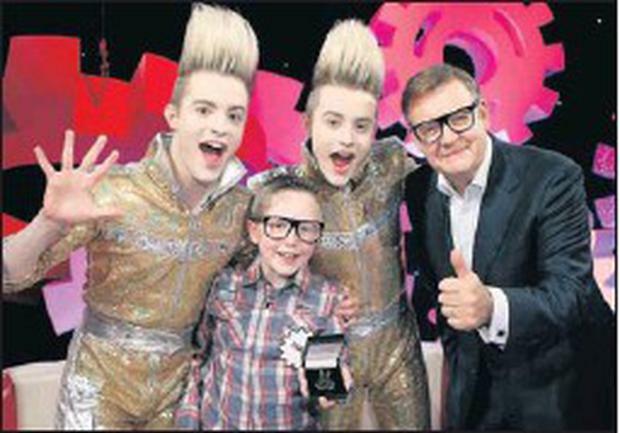 TWELVE-YEAR- OLD Cian Burns from Sligo will have a dream come true this Christmas when he reads the news on RTE television on Christmas Day thanks to those famous twins, Jedward! Cian will appear on 'OMG! Jedward's Dream Factory' which airs this Christmas Day at 11am on RTÉ Two and will run for ten days. The theme of the show is that Jedward will make dreams come true for children from all over Ireland on their first ever Irish television show. Cian is one of Jedward's dreamers and he will feature in the seventh episode. He has been practising his skills as a newsreader since he was tiny and it has always been his hope that he would read the news on RTE. His hero is RTÉ'S Bryan Dobson, and when Jedward heard this they arranged for him to go behind the scenes of a news report being filmed and put together. He got to read a news report and even met his idol Bryan Dobson himself for some tips! Cian enjoyed the experience so much that he fully intends to pursue the a career in news reporting/presenting.